TRIXIE Dog Bath Robe. This drying towel uses microfibre technology to dry your dog. The towel comes in a choice of 5 sizes and in the colour of blue. 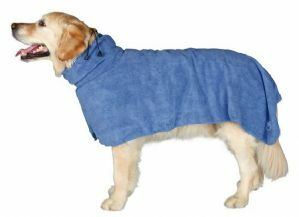 These are microfibre and highly absorbent - Ideal after muddy/raining walks, bathing or in the car. To use: Just pop over your dogs head, draw string cord to tightened if needed and tail loop. Machine washable up to 60deg if needed. SIZES ARE: XS 30cm, SMALL 40CM, MEDIUM 50CM, LARGE 60CM AND XLARGE 75CM.